Kerstin and I are planning a trip to the Swedish west coast this summer. In July 1850, Augusta and her family went to Gothenburg where her brother August was to board the brig Mimer for a journey to Cape Town. But first, they decided to make an excursion by boat up along the west coast. “Here [ in Gothenburg] we spent two days and on the morning of the third, August and I, as well as Mr. Lindgren and Malla, traveled to Strömstad with the steamboat Freja while Mother stayed in Gothenburg awaiting our return. 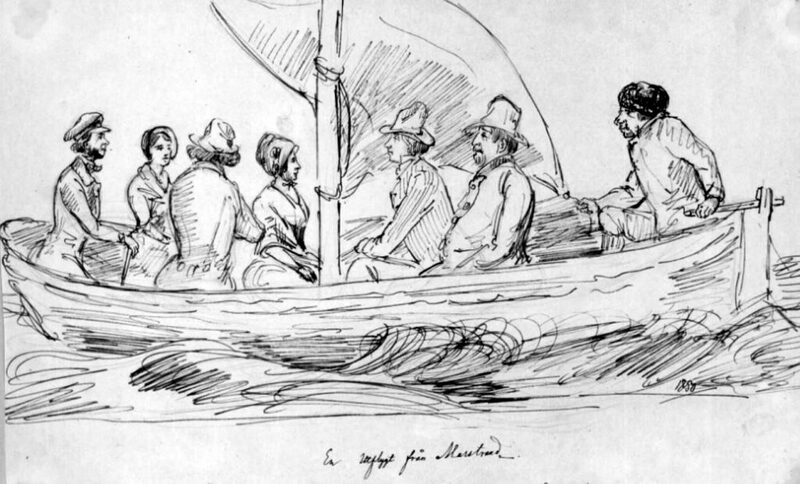 At Marstrand, where the steamboat stopped for a short time, I met several Stockholm acquaintances, including Augusta Holmqvist and Lieutenant Claes Bergenstråhle.” (Augusta’s diary, July 1850). Who were the acquaintances from Stockholm? Claes Bergenstråhle was one of Augusta’s friends from her teenage years in Stockholm, but Augusta Holmqvist was a name I hadn’t seen before. Jacobina Augusta Holmqvist was the youngest of 3 sisters. She was born in Jacob’s parish in Stockholm in 1832. Her oldest sister, Marie Charlotte, was born in 1822 and the middle sister, Johanna Emilia (Emelie), was born in 1823. The father, Johan Casper Holmqvist, was a merchant who also owned iron mills in northern Sweden (Sörfors and Gryttjen in the Medelpad province). 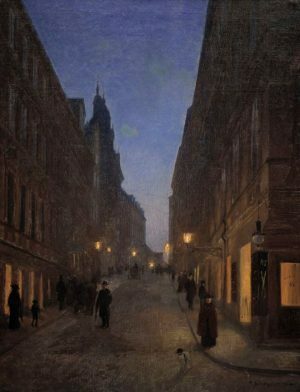 In 1835, the family lived at Regeringsgatan 36 in Stockholm – the corner of Regeringsgatan and Hamngatan. On this location, the large department store, NK, was built in the early 1900s. “Yesterday I wrote and declined to be a bridesmaid for Charlotte Holmqvist. I cannot in outfit compete with Ottiliana and Georgine Sparre and little Ahlberg ….”. The newly rich families aspired to have their daughters marry into aristocracy. Johan Casper Holmqvist managed well in this regard – all three daughters married noblemen. Charlotte even acquired the title of countess. 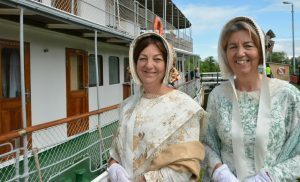 And both Emelie and Augusta’s husbands became marshals of the royal court. Emelie married Lieutenant Mattias Jakob Leonard Odencrantz. Charlotte married Count Claes Otto Vilhelm Sparre af Söderborg. Augusta married Lieutenant Patrik Oskar Reuterswärd. He later became a member of parliament and a businessman. Augusta Holmqvist married in November of 1852, a year and a half after our Augusta had run into her at the fashionable west-coast resort, Marstrand. The following year, she was blessed with a son, Carl Fredrik Casper Reuterswärd (1853-1932). On 24 February 1855, she gave birth to a healthy daughter but acquired childbed fever also known as puerperal fever. Augusta Holmqvist died two weeks later on the 12th of March. She was 22 years old. Two days later, the little daughter was baptized Hebbla Johanna Cecilia Augusta by the famous pastor Wallin. Puerperal fever was commonplace in the 1800s. It usually started on the third day after delivery. The symptoms, besides fever, included headache, rigor, severe abdominal pain and distension. Some doctors noted that it appeared to be epidemic at some hospitals. It was also known that more women died from puerperal fever when they gave birth in hospitals compared to giving birth at home. Remember that in 1855, the medical establishment had yet to accept the germ theory of disease, that is, that microorganisms or germs could cause disease. Although John Snow had just published a paper suggesting that cholera was caused by a microorganism and that boiling the water would prevent the spread of the disease, many still believed that bad air, miasma, caused the disease. Tuberculosis, which our Augusta was afflicted with, was sometimes thought to be caused by repressed feelings and a sensitive disposition. It wasn’t until 1882 that Robert Koch proved that it was caused by a bacterium. Dr. Semmelweis is not as famous as John Snow or Robert Koch, or Louis Pasteur for that matter. But his research had an immense impact on the postpartum survival of mothers. Dr. Semmelweis was a Hungarian obstetrician who worked at the Vienna General Hospital in 1846. The hospital had two maternal clinics and he realized that they differed in maternal mortality rate due to puerperal fever (4% vs 10%). The only difference was that the clinic with the highest rate also served as a teaching clinic for medical students. In 1847, a colleague of his died after having accidentally been pierced by a student’s scalpel while doing a postmortem examination. The autopsy of his colleague revealed the same pathology as that of women who had died from puerperal fever. Dr. Semmelweis hypothesized that maybe medical students carried some ”cadaverous particles” on their hands and which were transferred from the autopsy room to the birthing clinic. He postulated that a solution of calcium hypochlorite might destroy the particles and ordered everyone to wash their hands in this solution before going to the birthing clinic. The results were immediate. The death rate due to puerperal fever dropped to 1.9% within 3 months. The following year, there was 0% mortality during some months. The medical establishment did not believe in his cleanliness hypothesis. Dr. Semmelweis was dismissed from his position and harassed. Because of his anger against the establishment, he was committed to an asylum where he shortly thereafter died. It wasn’t until Louis Pasteur developed the theory that germs cause disease that Dr. Semmelweis’ work was scientifically explained and accepted. Dr. Semmelweis would be delighted to know that his keen observation and logical experiment were vital in establishing the germ theory of disease and that all children today learn to wash their hands with soap and water. * Castelli owned the house at Drottninggatan 53. He had a store where he sold accessories and other fine goods. The interesting thing is that Mademoiselle Frigel, whose private school Augusta attended, lived in one of the apartments in this house. But according to the household examination books, there are no records of any Odencrantz or Holmqvist living at this address.